Kambamba Jasper for Rock Tumbling - Polishes Great! This image shows a 3-pound bag of kambamba jasper tumbling rough, dumped into a colander and sprayed with water to reveal its full color. Click on the image for a larger view. A few pieces of Kambamba jasper that we tumbled. We really like the green and black bull's eyes and swirl patterns in the tumbled stones. 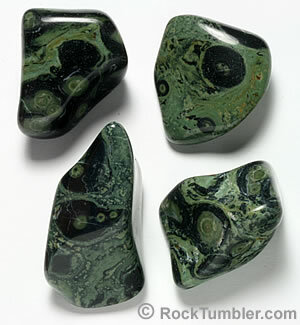 Kambamba Jasper is a green tumbling rough marked with black circles and swirls that is mined in Madagascar. It produces tumbled stones with spectacular "eyes" and "orbs". Some people believe that it is a fossilized stromatolite (structures built by sediment-trapping algae) but experienced paleontologists do not accept that theory for its formation. Kambamba does not have the proper pattern of growth lines almost universally seen in stromatolite fossils. These pieces of Kambamba Jasper are large enough to beautifully display its orbicular markings. They are also highly silicified. That makes them shape nicely in a rotary or vibratory tumbler and polish to a high luster with TXP aluminum oxide polish. Many people who see Kambamba for the first time confuse it with "nebulae stone" -- which is an igneous rock, an orbicular granite. Other people confuse it with "ocean jasper" which is another orbicular lapidary material also found in Madagascar. (Madagascar is a large island in the Indian Ocean, off the east coast of Africa). People let them imaginations run wild with strange rocks like Kambamba. 1) More Time: Although Kambamba Jasper is a little softer than most agates and shapes nicely, it will require more time in coarse grit than beginner's tumbling roughs. In six, twelve and fifteen pound capacity barrels two weeks might be enough to shape the rough to your satisfaction. However, in small tumblers of two or three pounds capacity, three or four weeks might be needed. We suggest running Kambamba Jasper in coarse grit for two weeks, clean the rough and the barrel, then run another week or two in coarse grit unless you are happy with the shape. If you are happy with the shape, move on to medium grit. 2) Media Needed: This material is in pieces that range between 1" and 2" in size. For that reason, we add about 25% ceramic media to fill the voids between the larger pieces of rough. The cylindrical shape of the ceramic media acts like a roller bearing and gives the rocks a smooth tumbling action in the barrel. The small pieces of media also deliver grit to all surfaces of the rough. Coarse Grit Step: Fill your tumbler barrel 2/3 full of rough and media (we use about 20% media and 85% rough). Then add 2 tablespoons of coarse (60/90) grit per pound of material in the barrel. Add enough water to cover the tops of the rocks. Run the material in coarse grit for 2 weeks. After two weeks check your material. If you are happy with the shaping move onto the medium grit step. If more shaping is needed, clean the rough and start tumbling again with a clean barrel and fresh grit. At the end of all steps in the rock tumbling process, make sure to clean your rocks and barrel to reduce the chance of coarser grit contaminating the finer grit steps. This cleaning is especially important before you begin the polishing step. How Many Weeks In Coarse? A little judgement will be needed because every barrel of rocks will be different. They have different sizes, different shapes, different compositions. And, tumblers come in many different sizes, different shapes and run at different speeds. The human brain must be used to get optimal results. You will become wiser and get better results through paying attention and gaining experience. Medium Grit Step: Put your cleaned rough back into the barrel. Then add 2 tablespoons of medium (150/220) grit per pound of material in the barrel. If the barrel isn't at 2/3 full, add a little more media to bring it up to operating capacity. Add water until it is just below the top of the rocks. Tumble for one week. Fine Grit Step: After clean-up, put the rocks back into the barrel using 2 tablespoons of fine grit (500F) per pound of material. Again add water to just a little below the top of the rocks. Tumble for one week. The rocks should now be smooth and possibly starting to get a slight luster. Polish Step: IMPORTANT: Make sure that your barrel and rough have been cleaned thoroughly. Any grit carried over from a previous step will likely ruin your polish. Place the rough in the barrel with two tablespoons of TXP polish for each pound of material in the barrel. Add enough water to almost cover the rocks and let it tumble for one week. You should have polished rocks at the end of this step. Place your material back in the tumbler bowl, then add enough polished ceramic media to bring the load up to the manufacturer's recommended operating level. Add one tablespoon of grit for every two pounds of material in the bowl. Then, turn the tumbler on and slowly add water until the material has a thin coat of wet grit and the tumbling action is smooth and fast in the bowl. Place the cleaned material back in the bowl. If needed, add ceramic media that has been previously polished, to bring the bowl up to the manufacturer's recommended operating level. Add one tablespoon of polish for every two pounds of material in the bowl. Turn on the tumbler and slowly add water. Stop adding water when the material has a thin coat of wet polish and the tumbling action is smooth and rapid. If you would rather just purchase tumbled stones of this material. We usually have medium-size tumbled Kambamba Jasper here.